I've recently realised that a lot of the time I can't keep up with all the new makeup and beauty products; mainly because I've got a bathroom full of products so thought I'd give you all an insight into my other passion.. cooking! This months Flavourly box included a Kents Kitchen meal kit. I cooked it up this evening for me and the Mr so thought I'd do a bit of a review on it with some step by step photos. I then cooked the chicken in pot 1; the garlic infused oil-for 3 minutes before adding the onions and pepper. I also at this point put some rice on to cook in the pan behind. I then let this all cook for 5 minutes and treated myself to a Bulmers whilst I waited! 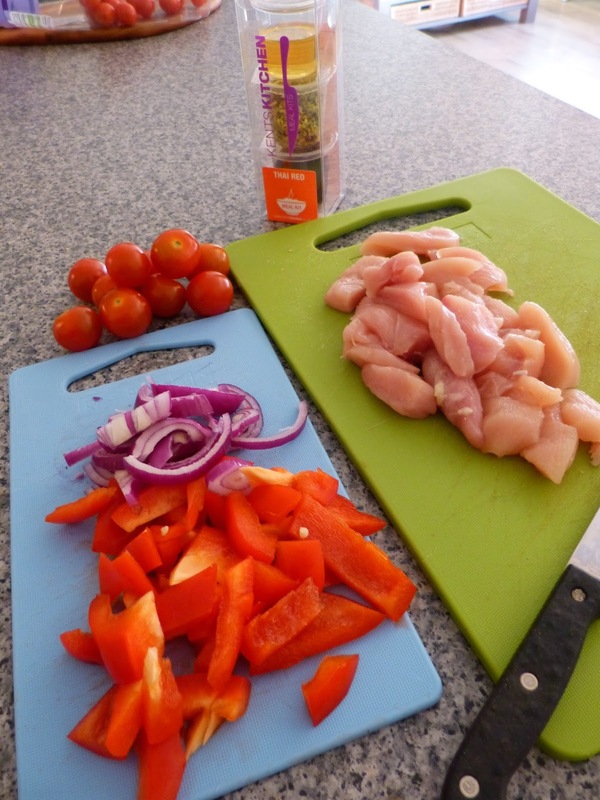 Once the chicken browned a little and the veg started to cook I then added pot 2- the Thai red curry paste. This contains vegetable oil,salt,coriander, paprika, chilli, lime powered and tomato. Pot 3 is the garnishing pot- this contains desiccated coconut, crushed chillies and coriander leaves. 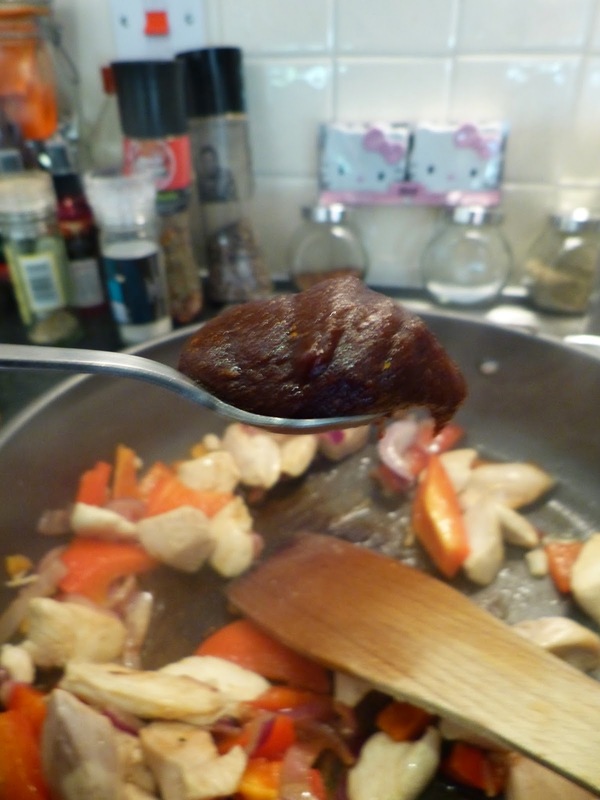 Once the chicken looked suitably browned I then added the garnish pot- wow this little pot contains a lot of flavour! It smells so coconutty! 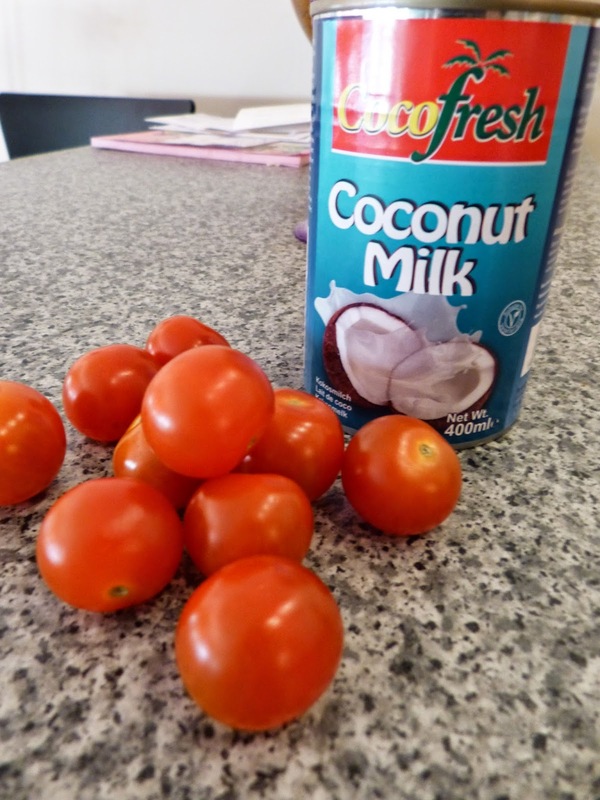 Cherry tomatoes and a 400ml tin of coconut milk. Shop around in Tescos for this- I originally picked up a can which was £2.05 but then spotted a can for 69p in the international food section! Once added (and not looking that appetising at this point!) I then left it for about 10 minutes to simmer. Whilst the Thai curry was cooking away I got this little beauty out from the cupboard. This is a fresh herbs and spice Raitha mix I picked up at the BBC Good Food last weekend at the NEC in Birmingham from one of the traders- Mr Huda. I love Raitha so this really caught my attention- I've made it myself before but never had all the spices we needed for it to taste spot on. Water, garlic, corriander, tamarind, mint and chilli with some natural colouring. You only need a teaspoon of the stuff! 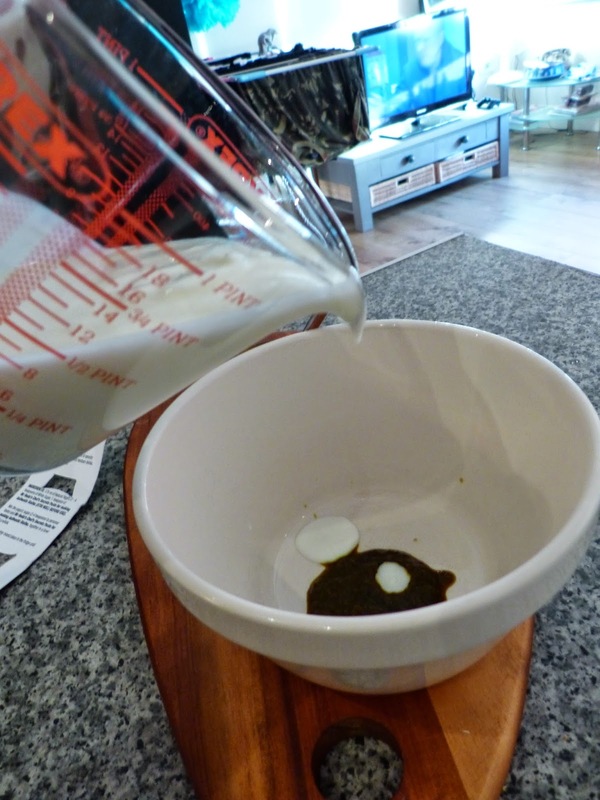 Then add 175ml of natural yogurt- I used Tesco's low fat natural yogurt. Once you've made your Raitha the Thai curry should be just about ready to serve. The coconut milk will have thickened and the cherry tomatoes will have started to breakdown to add to the nice sauce. Get your rice prepped and you are ready to serve! Of course with any curry you have to have the accompaniments- poppadoms for me and naan bread for the Mr (plus a can of beer!) along with the Raitha. And thats it.. you are ready to dig in! I really enjoyed using the Kent's Kitchen kit, the flavours tasted so fresh and it smelt delish during the cooking stages too! 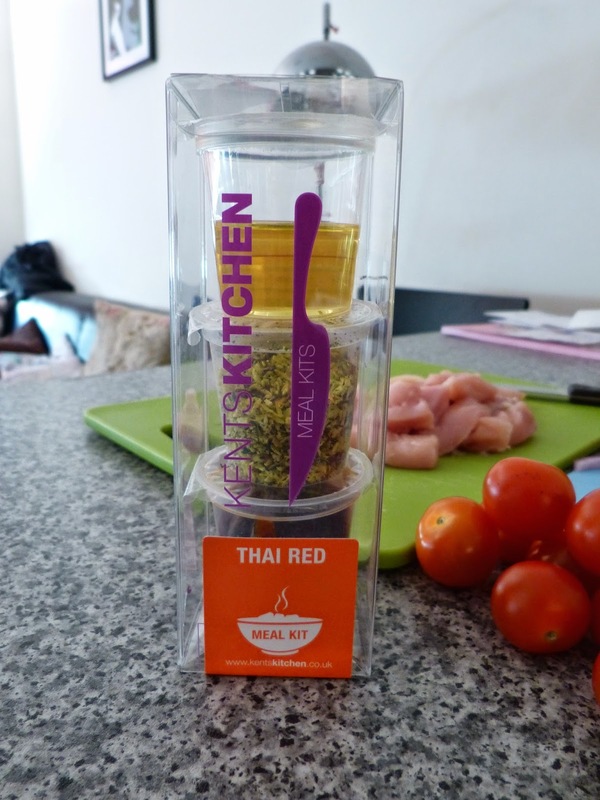 The instructions were really easy to follow and I love the fact they include an infused oil, this really flavoured the chicken from the beginning and when tucking in you could taste it for sure. I much prefer this type of convenience cooking to the jars of unflavoured stuff you can pick up these days, none of the flavour in the jars seems to stick to the meat at all so this was a nice change. The Raitha was out of this world... 100% recommend this product. It was really tangy and minty and went beautifully with the curry and poppadoms. 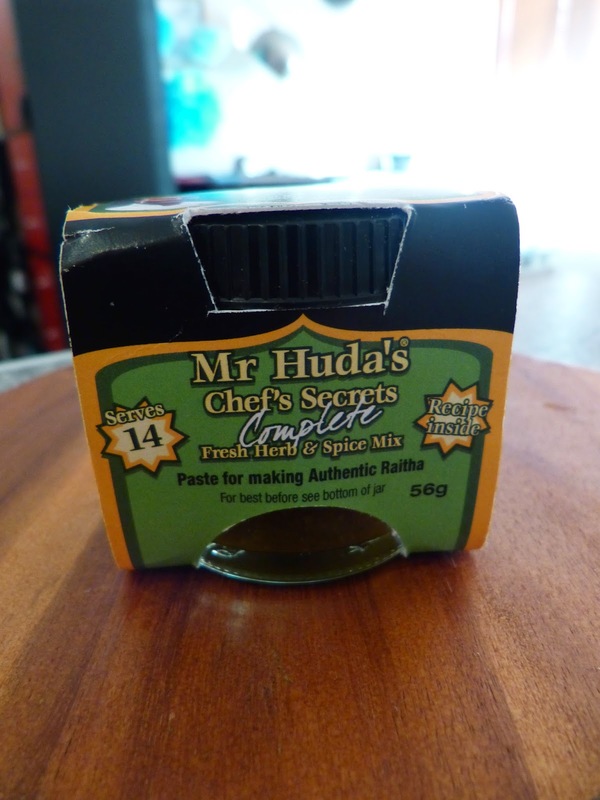 Mr Huda's do tons of other pastes, the next one i'd like to try is the onion Bajee paste. What is your friday evening meal treat?